Last week I took a mental break and knit five simple cloths, not yet declaring them either washcloths or dishcloths. This week I continued my mental break by knitting five more cloths with scrap cotton, but I changed up the knitting pattern. Five cloths per week wasn’t a goal, by the way. Apparently it’s my default cloth-knitting rate. This set of cloths was knit as garter stitch mitered squares. I was using double-point needles — the only kind I haven’t packed for some reason — which made these blocks a little more challenging than last week’s blocks. Last week’s blocks started with a few stitches, widened to the diagonal length of the cloth, then narrowed back down to a few stitches. The mitered squares, on the other hand, started with casting on all of the stitches along two sides, then narrowed down to one stitch at the opposite corner. I went from having at most about 55 stitches on the needles to having up to 85 stitches on the needles. As I was working, I had to be careful not to let the stitches slide off the other ends of the needles. Thankfully, the cotton was stiff enough to hold the stitches pretty well in those instances when I dropped a few. Once again, I had fun mixing the colors, although as my stash dwindled so did my color options. I think the cloth that I had the most fun making was made from scraps of scraps in an assortment of colors. As I was knitting the cloths last week, I made a point of only starting a new color at the end of a row. It meant that I was left with some extra lengths of yarn after the ends were woven in that ranged in length from about seven inches to maybe 15 inches; not enough to really use on their own, but too much to throw away. I knotted those pieces together with simple square knots then knotted each end to a length of neutral-colored yarn. As I knit the cloth, I let the yarn ends poke out freely. I love the playfulness of this cloth, and almost wish I had cut the scraps down further so there would be more knotty ends. I still have a decent stash of cotton yarns, but I’m done making cloths for now. My goal, besides taking a mental break, was to work through the smaller balls of yarn and I’ve done that. The remaining balls of cotton are larger amounts that could maybe aspire to something more than a cloth — although I won’t say “just” a cloth because I’m so happy with how these turned out. 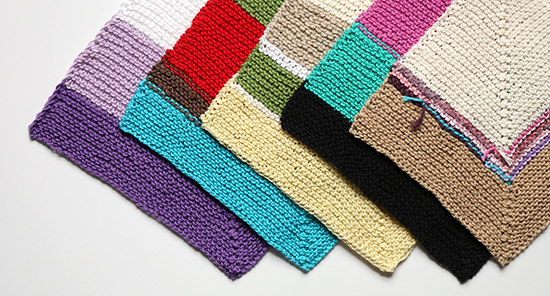 What are your favorite ways to use up your scrappy stash? Nice work! Knitting dish cloths is my default project as well, when I just want to knit and don't have anything special in mind. 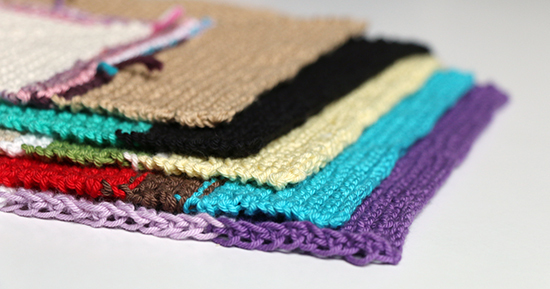 I use a clean dish cloth every day, and have lots of color choices. Thank you, Sylvia! I use a new dishcloth every day also, and it seems like I can always use a few more.